alaTest has collected and analyzed 40 reviews of John Lewis Soyuz 6 Halogen Spotlight Ceiling Bar, Polished Steel. The average rating for this product is 4.5/5, compared to an average rating of 4.5/5 for other products in the same category for all reviews. We analyzed user and expert ratings, product age and more factors. 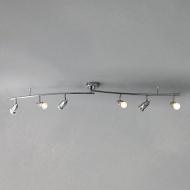 Compared to other products in the same category the John Lewis Soyuz 6 Halogen Spotlight Ceiling Bar, Polished Steel is awarded an overall alaScore™ of 83/100 = Very good quality. My kitchen had a dreary fleurescent tube - which blew - replaced it with this and the effect is wonderful. The lights are directional so each part of my kitchen has a spot light on it. I cannot be happier. Order processed without hitch with delivery on schedule. I have evert confidence on JL always meeting the highest standards. We bought two sets of ceiling spotlights. They are very smart and easy to install. After eight weeks of use, six of the twelve spotlights have failed. We have ordered some LED spotlights which should solve the problem. Overall we are satisfied. Lovely spotlight effect - nice and bright looks just right in my kitchen. Lovely fitting, great light, unfortunately all bulbs failing after 4 weeks of use. We needed this to add more light into the kitchen. Not easy to put up. Not all lights are fully rotational. Still trying to get the right angles & directional light right.